By now we’re pretty used to the shape and design of how Tesla builds its battery packs: like a flat battery brick under the floor of the car. It’s a simple and straightforward shape, but there’s a different way to do it. And that way, the way nascent startup Lucid Motors does it, is quite excellent. 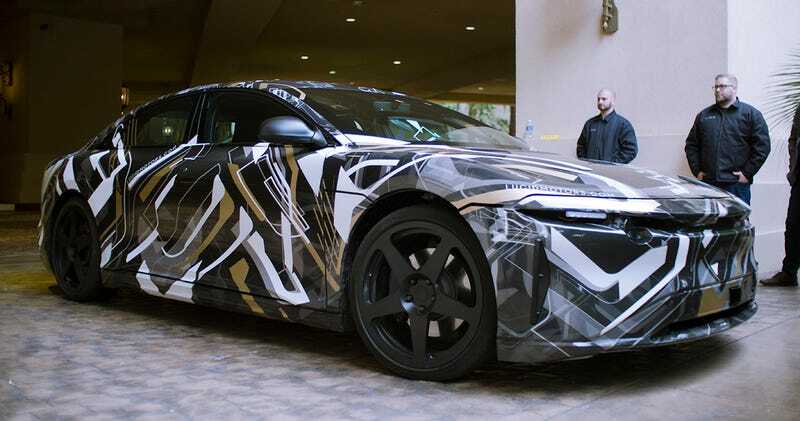 Faraday Future may have hogged most of the car-related headlines at CES so far, but there’s another startup—one with similar ties, if you can believe it—that’s been taking a bit more of a stealthy, put-up-or-shut-up approach. I talked for a while with Lucid’s people about how much work the company has ahead of it, how it hopes to start low-level production within two years, then use the money from those early cars to go into more volume production from there and then get into developing other cars. That was what we mostly wanted to hear from Lucid, but we weren’t going to turn down a ride in an engineering prototype. Why? Engineering prototypes are cool as hell. Lucid, which started out as a battery company made up of ex-Tesla employees all the way back in 2007, doesn’t fit its batteries into one big pancake. Chief Technology Officer Peter Rawlinson explained to Jalopnik that Lucid instead divots the battery pack in the passenger compartment. It’s not as cheap or as simple as Tesla’s design, but it gives more room for the people inside the car and lets Lucid make a roomier inside for their car out of a smaller exterior set of dimensions. It’s bigger on the inside than any other car of its size would be, is how Lucid put it. Having clambered into the back of one of Lucid’s alpha-level prototypes, I can say that, yeah, it is unbelievably roomy in one of these cars. Lucid is particularly proud of its seats for the car it wants to put into production for a good six figures. But this prototype did not have those seats. It had a big bench in the back out of I don’t know what and a couple front buckets out of a Volvo. The steering wheel was Fiat Chrysler, the dashboard was nonexistent. There was just a big bar across the car everything was bolted to and a bunch of bundled wires behind it. Get into a stripped rally car and you’ll get a similar view. Seeing this with mounted displays giving battery temperature readouts is impossibly cool. But I want to get back to the space in this car. My good god, is this thing roomy. It’s laughable to say it’s bigger in the back than a Mercedes S-Class. This thing puts an old Lincoln Town Car to shame. You have to almost get up out of the back seat and lean way forward to talk to anyone up front. You often can’t hear them clearly all the way back, though some of that was from the clunks and whirrs of the prototype itself. It hasn’t yet been filled with sound deadening foam or whatever else carmakers do to make their cars whisper quiet. Here’s our video guy Mike Roselli in the back of one. He’s just about lost in the back there. The space of the car was what really stuck out to me. Rawlinson, our very joyous driver, was thrilled with how he had designed the front double wishbone suspension not only for compliance with new and difficult front-overlap crash tests, but also provide good steering feel. Traditionally there’s a compromise against how the car drives, but as a longtime veteran of working at Lotus, Peter thinks he figured out a way to make the whole thing feel right. He also beamed about how they had designed the cooling system to give the car not just short, hot bursts of power, but give good performance across long range. And the car is wildly fast. I don’t think Peter ever gave more than a third throttle and it came out of corners like a BMW M3 on full gas. And it was totally planted, totally composed. Of the three new upstarts in the electric car world—Faraday Future, LeEco and Lucid—it’s Lucid that seems like the most grounded and open. Both Rawlinson and Lucid’s design chief Derek Jenkins were pretty up front about how thin the tightrope is for their company, needing one round of funding to get to the next, to build a car that will fund its later production. While their competitors have been delivering platitudes and hyperbole about “reformatting the future,” Jenkins and Rawlinson were dead honest about tough the business side of their company is. But at least it seems like the product and engineering side seems to be nailed down and legit. You get Bugatti Veyron-levels of power with huge range, more room than an old taxi, and side-flip headlights. I kind of want one of these things. With any luck, people who also want them will be able to buy them one day.